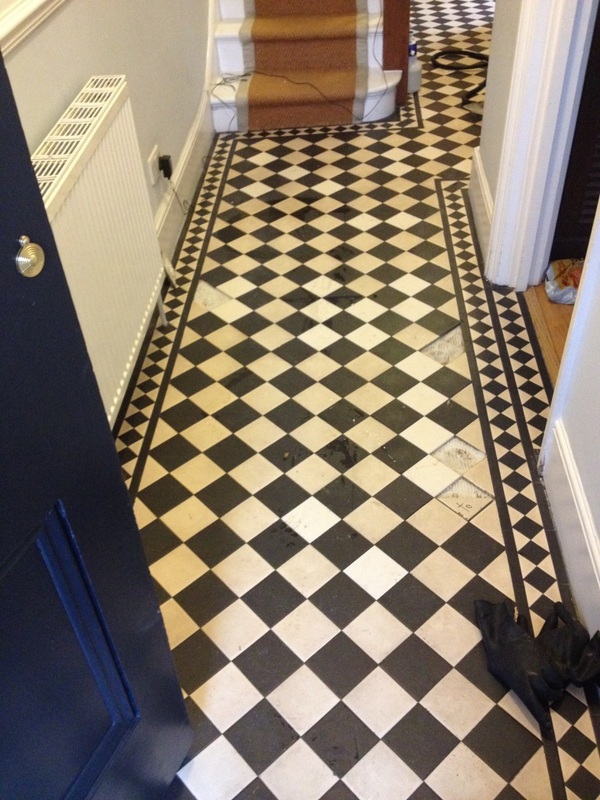 This Edwardian style floor had been installed in a house in Twickenham around five years prior. 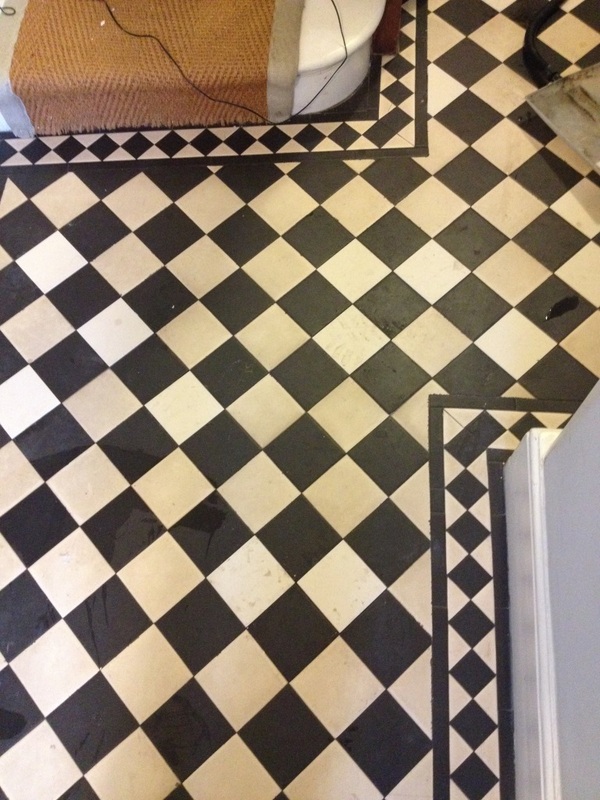 The floor had a number of damaged tiles which needed replacing and that it had not been professionally cleaned since being installed and the original sealer had either worn off or turned yellow. Before cleaning the broken tiles, adjacent grout and tile adhesive was carefully chipped out of the floor using a hammer and chisel. Once this was done the floor was soaked with a dilution of Tile Doctor Pro-Clean which was applied with a mop and left it to dwell before being scrubbed into the tile using a rotary machine fitted with a scrubbing pad. The machine saves a lot of time however it struggles to get into the edges and corners and so it was necessary scrub those area by hand. The now soiled cleaning solution did a good job removing the dirt and old sealer and was washed away using fresh water and a wet vacuum. The tile and grout was inspected and the process repeated where required before giving the floor a final rinse to remove any trace of cleaning product. At this point the broken tiles were replaced with spares and grouted into place; the floor was then left for 48 hours so it could dry out thoroughly before sealing. 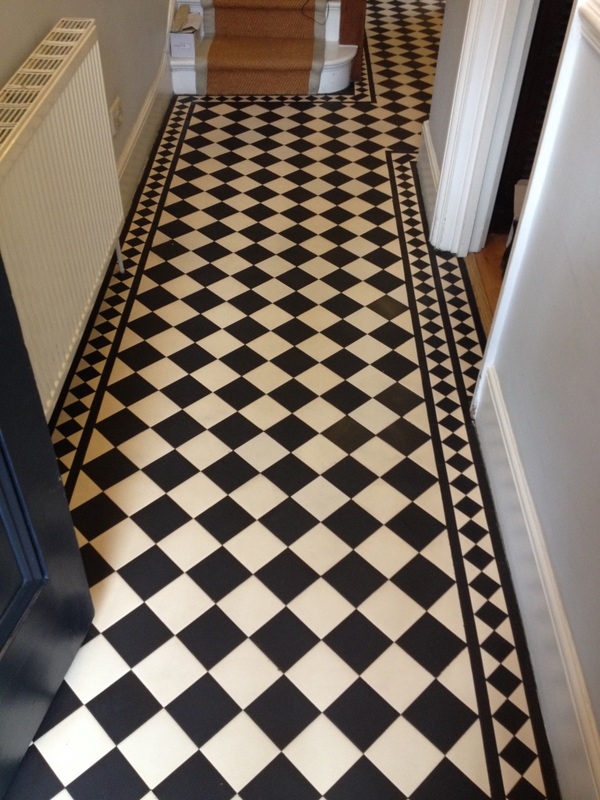 On our return the floor was checked and then sealed with five coats of Tile Doctor Seal and Go which is a topical high sheen sealer highly recommended for these types of tiles that will enhances the look of the tile and creates a barrier against dirt and spillages.